stealth of nations: problem or solution? 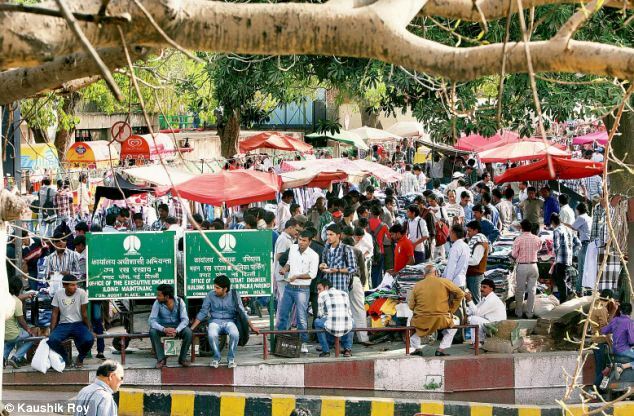 Street hawkers have multiplied recently in New Delhi's Connaught Place, and the Daily Mail newspaper claims that the entrepreneurial invasion is blocking traffic and 'compounding the misery of commuters.' Though the police claim that only 97 vendors work around the circular shopping arena, the newspaper counted 800 street sellers. I was in Connaught Place late last year--and the big culprit for congestion was the government's rehabilitation plan, which involves tearing up vast swatches of the circular market and is creating massive interference of traffic and pedestrian flow. There were hawkers all around the market--and I can well believe there were 800 of them spread around the various lanes of the Connaught Place installation--but they hardly were the impediment the newspaper makes them out to be. Their stalls were orderly and blocking traffic (the Daily Mail's own photo shows a hawkers market that is not blocking traffic.) Indeed, the biggest impediments in the market were the sad profusion of stray dogs, who seem to be almost universally despised by merchants and commuters alike and the number of empty storefronts--most likely a result of speculation that rents will go up following the completion of the government's rehab effort. Being punitive towards the hawkers is no solution. Rather, it's important to work with the street vendors to improve conditions for everyone.